Falling in love is simple. Staying in love is another thing entirely. We all want amazing relationships and yet rarely do we think much further than getting past finding ‘the one’. You want your relationship to go the distance – you want it to thrive! You want to defy the odds and be one of those happily-ever-after-for-real relationships right? To give yourself a fighting chance, you’re going to have to try something new. That’s where the Relationship Checkup comes in! Here’s the truth: happy & healthy relationships are WORK!! Plus the expectations of relationships these days are so big, it’s almost impossible to create long-lasting fulfillment and connection. Put those idealized expectations together with ineffective communication styles, unproductive coping methods, plus go-nowhere relationship patterns from your past, and it’s no wonder love fails so often! “The Relationship Checkup is helping us keep the honeymoon alive! We learned a lot about each other and what we can do to support each other better. What if you could learn a productive way to tell your partner what you needed? What if you actually felt heard? What if you were actually comfortable dealing with your partner’s feelings? What if conflict was no longer scary? What if you could keep the passion and romance alive? Your relationship CAN go the distance! “Working with Heather and doing the Relationship Checkup opened our eyes to how we’re going to get our ‘happily-ever-after’. What if you had real confidence that you and your partner were going to become one of those couples? You know the ones – the couple everyone is silently annoyed at and envious of all at the same time. The ones that are still being all lovey-dovey and happy after decades of being together. What if that could be you? It’s time to learn something new. Using a research-based and scientifically proven method you’ll get headed off into the sunset in no time. With this is a preemptive approach you’ll be fortifying your relationship against the long-term (and 50% +) likelihood that it will fail. further down the road and recognize there’s an unfavorable drift happening, now is the time to start. If not, can we get back on track? What are tools we can use to ongoingly keep us happy and satisfied? Imagine having the confidence of knowing how healthy your relationship is! Don’t spend any more time wondering. Discover the health of the friendship in your relationship. Then learn what you can do to strengthen it using specifically designed tools created from the Gottman research. See the true strengths of your relationship and explore various ways of expanding those. This will help you continue to improve your connection and happiness over time. Learn how you currently solve problems and manage conflict – does it work or not? Then identify constructive ways to have difficult conversations that ensure you feel supported and heard rather than shut down or disconnected. Sound too good tobe true? You also get specifically designed tools created from the Gottman research to help you achieve this! Figure out how and where you can make a real difference in the happiness and satisfaction of your relationship. 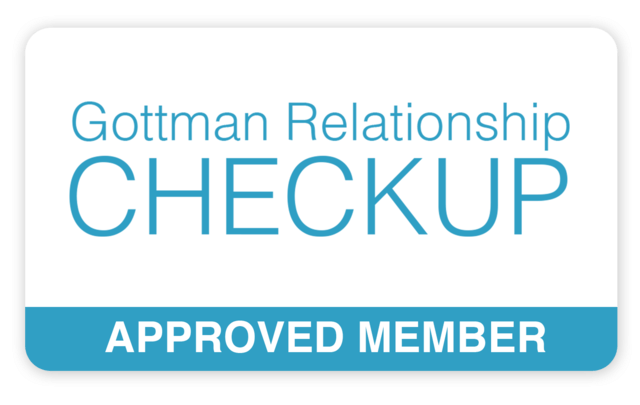 Learn about Gottman tools to support you in defining and establishing your long-term relationship goals; making sure you and your partner are on the same page and set up to support each other in fulfilling those life dreams. In a short period of time, you’ll have a plan that will support you in knowing what to work on and how. Plus a structure to help you celebrate the good stuff you’ve already got going on – even if you’ve kind of forgotten about some of it. You have the power to be an active player in the success and happiness of your relationship! Otherwise, left to run its course (because that’s often easier than facing issues) the quality and happiness of your relationship WILL decline – that’s not up for debate. So let’s not leave it alone. Let’s do something that will make a difference NOW and set you up with the tools to talk to each other in a way that builds connection and manages problems at the same time. Let’s teach you how to take care of misunderstandings and frustrations in a healthy way that brings you and your partner closer together, for the long haul.